ModCloth is launching a magical new line of home decor items for you to beautify your apartment. 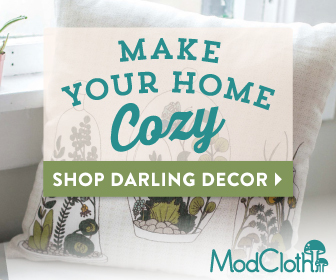 Take a look at some of the new items here: ModCloth Retro & Cute Apartment Decor! They have the cutest kitchen and bathroom items to make your home playful and elegant, all at an affordable price too. And they offer free shipping on all orders over $50, so don’t be shy when you find a few things you love at ModCloth! Have to admit I had to check it out. Always looking for new decor for a new, fresh look. This is especially important as the seasons change. Fall colors are different from summer, and I’d like to have a few pieces to show that. Nothing big but some simple cute things. Love that there is free shipping. Checked it out and they do have some cute things, bookmarked it! ModCloth doesn’t just have a cute Retro section. What I love is that there are also accessories for clothing and clothes themselves at affordable prices. I’m always looking for makeover ideas, thank you for introducing me to ModCloth!